Leinenkugel Summer Shandy is one of the most popular shandy beers available and is one of the regular seasonal offerings from the famous Wisconsin brewery. 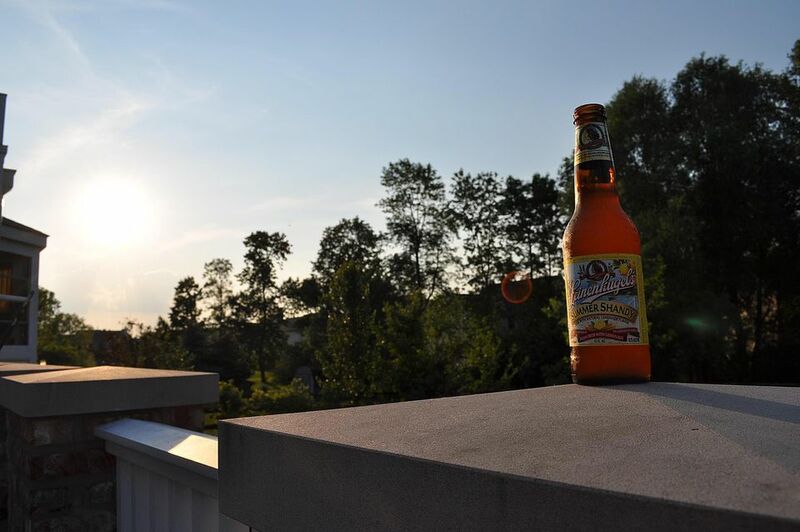 What is a Summer Shandy? A shandy is actually a mixed drink made from beer - typically Pilsner and lemonade. It has, in recent years, been produced and bottled as a pre-mixed beer and sold by a number of breweries. Leinenkugel's Summer Shandy is one of the most readily available shandies on the market. Leinenkugel's also produces a number of other seasonal shandy beers that rotate throughout the years. Some make a repeat appearance through the years and others are one-time offerings. Summer Shandy seems to be the one constant shandy in the Leinie's line up and others include Harvest Punch Shandy (pumpkin spice - autumn), Cranberry Ginger Shandy (winter), and Grapefruit Shandy (summer). The shandy pours pale yellow and cloudy. A thick, medium, creamy head sits atop for a decent amount of time and leaves a bit of lacing on the sides of the glass as the beer, er, shandy goes down. The aroma is dominated by lemon; from the moment the bottle is opened the lemon nose is apparent. The flavor is quite surprisingly not as lemony as the aroma. A decent amount of ale sweetness comes through, enough to balance the lemon and to raise this drink above the level of the malternative and alcopop (see below). That's not to say that this is a good beer, but it is an enjoyable summer beverage. What is a Malternative, You Ask? Malternative and alcopop are two names given to the often heavily marketed malt beverages that are sweet and typically flavored with fruit. Also known as chick drinks among many beer drinkers, malternatives include your hard lemonades, 'twisted' teas, and other too-sweet alcoholic beverages found in the beer coolers. Malternatives are, admittedly, not the best tasting alcoholic drinks available. However, they continue to increase in popularity. Many of the more popular cocktails are now being bastardized into these convenient bottles that are often little more than spiked soda. While they're often looked down upon by serious beer and cocktail drinkers. Some drinkers really enjoy them and if you are one, have at it!